Robust economic growth in the developing world, an increasing number of women joining the workforce every year, the rising penetration of retail and e-Commerce and changing customer patterns are the biggest drivers in the global frozen fruits market. 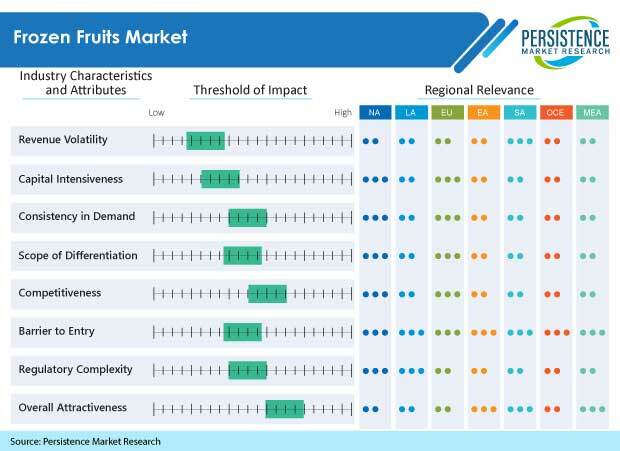 In the report, ‘Frozen Fruits Market: Global Industry Analysis and Forecast, 2016—2022’, Persistence Market Research (PMR) has conducted an in-depth study of the global frozen fruits market based on several key parameters such as CAGR, Y-o-Y growth rate, absolute dollar opportunity and incremental dollar opportunity. The global frozen fruits market has been studied for the seven year period from 2016-2022. The analysts at PMR have provided their expert opinion on both the current and expected future trends in the global frozen fruits market that can be invaluable for any organization looking to make key business decisions. The global frozen fruits market has been studied on the basis of five geographic regions viz. North America, Latin America, Asia Pacific, Europe and the Middle East. The global frozen fruits market report provides Y-o-Y growth projections, absolute dollar opportunity, the market value and volume on the basis of Country, Fruit Type, Technique and Application. Relevant facts related to the largest markets in each region are given in the global frozen fruits market report. As with every other report, a few assumptions have been made and certain acronyms have been used while preparing the global frozen fruits market report. These have been adequately explained in a separate section. Readers can refer to this section at the outset to ensure that they thoroughly understand the global frozen fruits market report with all of its nuances. The executive summary of the global frozen fruits market report provides a first glance at the global frozen fruits market. The summary includes a broad overview, some important drivers and restraints, the competitive landscape, and the regional split and segmentation in a pie chart format. The summary concludes with advice from PMR experts on which Application and Region stakeholders should target, along with a differentiation strategy to truly stand out in the global frozen fruits market. The global frozen fruits market is highly competitive and it is quite difficult for any one company to dominate. The report has a dedicated section for the competition landscape where information related to a number of the key players has been disseminated. The global frozen fruits market report highlights the innovations pertaining to specific companies. Important transactions that have impacted the global frozen fruits market, company details, key strategies chosen, revenue, Y-o-Y growth, Net Operating Income, major products, SWOT analysis and recent developments complete the competition landscape. The global frozen fruits market report overview section touches upon the market dynamics i.e. the drivers, restraints, opportunities and threats that can have an impact on the global frozen fruits market. A market forecast for the study period from 2016-2022, Y-o-Y growth projections, and absolute dollar opportunity analysis serves to educate the readers. This section also includes facts concerning the cold chain, supply chain, freezing equipment, frozen fruit cost analysis and the import-export scenario of frozen fruits and nuts. Government regulations that must be adhered to mandatorily in the global frozen fruits market can be referred to here. The value chain analysis has given a comprehensive explanation of the relationship between the farmer, aggregator, exporter, wholesaler, importer, retailer, buyer and consumer in the global frozen fruits market. A few readers may wish to be informed about the global frozen fruits market from the ground level itself. These individuals can refer to the introduction section of the global frozen fruits market report. The definition explains in a brief yet simple manner what frozen fruits are along with the two main methods of producing them i.e. IQF and freeze drying. Persistence Market Research has pioneered an industry leading research methodology while analyzing the global frozen fruits market. The analysts first conduct exhaustive primary and secondary research to formulate a detailed discussion guide. A list of industry players comprising manufacturers, distributors, retailers and industry experts is developed. After intense interviews with industry experts and key market players, the required data is gathered. This data is then validated using the triangulation method where primary and secondary research is combined with PMR expert analysis to arrive at the final data. The final data is thoroughly scrutinized with the help of advanced, proprietary tools to obtain qualitative and quantitative insights concerning the global frozen fruits market. The red fruits & berries segment is anticipated to retain its dominance in the global frozen fruits market throughout the study period ending 2016 – 2022. The red fruits & berries segment by fruit type is expected to reach around 53% market value share in 2022.Even though red fruits & berries is already the largest segment, it should still record a substantial CAGR of 4.8% in terms of value during the period of assessment. At the end of the year 2015, the red fruits & berries segment was valued at just over US$ 965 Mn and this is predicted to rise to above US$ 1.3 Bn by the end of the forecast period. An absolute dollar opportunity of more than US$ 67 Mn can potentially be exploited in the red fruits & berries segment in the year 2022 over 2021 making it too large and lucrative for any stakeholder in the global frozen fruits market to ignore. In terms of volume, the red fruits & berries segment was pegged at almost 849 thousand tons in the year 2015, and this is widely anticipated to grow to above 1000 tons by the end of the year 2022. The CAGR for the red fruits & berries segment in terms of volume is 3.7% over the forecast period. For the period 2016-2022, the Banana sub segment is expected to grow from a market value of under US$ 77 Mn in the year 2016 to almost US$ 107 Mn in the year 2022 with a significant CAGR of 5.6%. The Watermelon sub segment is also anticipated to record a similar CAGR of 5.6% that will allow it to jump from a market value of slightly under US$ 61 Mn in 2016 to over US$ 84 Mn at the end of the forecast period. It seems quite unlikely though that either the Banana or the Watermelon sub segments will be able to surpass the Strawberry sub segment in value terms as the latter was already worth more than US$ 400 Mn in the year 2016 itself. With respect to consumption, the Strawberry sub segment is anticipated to record the highest CAGR of 3.9% in terms of volume. From a volume of slightly under 351,000 tons in 2016, the Strawberry sub segment is predicted to rise to above 441,000 tons by the end of the year 2022. With respect to revenue contribution, the red fruits & berries segment in the Asia Pacific frozen fruits market is predicted to grow at a robust CAGR of 6.4% for the duration of the study. This will allow the red fruits & berries segment to reach a market value of nearly US$ 95 Mn in the Asia Pacific frozen fruits market by the end of the year 2022 from just under US$ 65 Mn in 2016. The red fruits & berries segment in the North America frozen fruits market was already worth a little more than US$ 376 Mn in 2016, and should jump to more than half a billion dollars by the end of the forecast period, with a value CAGR of 5.3%.